Anyone got a Hitachi drill charger model UC18YRL/YFL? Resistor on board fried beyond recognition/testing. Only 4 screws on the back to take a look for me. That's a relief cos I now don't need to stress about getting the screws out! If it has burnt out, it almost certainly means something else has gone. but worth a try. I would not be at all surprise if FET1 was dead. Thanks all! Looks like @dpmiller found the same link. But is it brown/black/ORANGE? R8 looks like a 10K 1/4 watt resistor. 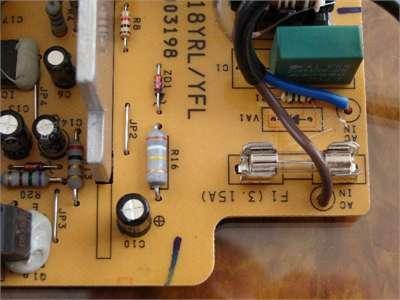 these resistors and Fet: 2SK2996 were defective"
Me too but it's not mine and the owner's tight! Glad it's not just me that finds resistor colour codes difficult to distinguish. It needs someone with a working one to probe it with a multimeter. some resistor colour bands can go odd colours if the resitor is routinely running hot. The old 4 band ones were easy, at a glance. Yes, they were, also the colours were easier to distinguish. I can think in the old colour codes, and look through a box of resistors and subconsciously view them in terms of value, without having to think about converting colours to numbers (might be a side effect of synesthesia, though, as I think of words as colours anyway, today is black, being Sunday). The newer, dark coloured, resistors, with the new (well, ~20 year old now) colour code are a lot harder to decode, and often seem to need both mental effort and a magnifying glass. I find the new brown and red bands particularly challenging to distinguish. I'm not colour blind either, but can sense what it might be like to be colour blind when trying to decode these, especially some of the dark background MF12 series ones. I was about 12 I think and more interested in scavenging old tvs, hi-fis or anything with a plug from dumps and tips than anything at school. As payment for digging a neighbours footings me and a mate got breakfast bought for us in some cafe in Deptford opposite the doss house. He got cash on top, I got the whole E12 range of resistors from Garlands! Then Maplin came along and killed them all. Indeed. And everybody sold the same Altai stuff. As a teenager, I worked in an electronics repair shop- TV, video, group gear, CB. The Boss made a proposition to Maplin which they flat out refused. It was another ten years before they appeared in NI.